Manufactured by Burlington Welding, LLC; and designed by the original inventor of the first portable wheel corral here comes the Cadillac line of portable corrals, the Diamond W. Diamond W Corral products are built with ease of use, quality, and longevity in mind. 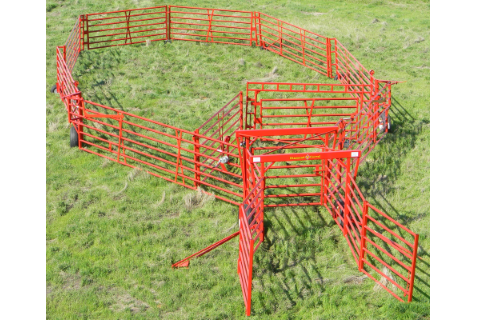 We offer 3 tubing styles of corral. Also, Chutes & Alleysways with and without tub options, Sorting System, and even a Cattle Box, to tie everything together. Each unit comes with a 1-year limited warranty, and we are always looking to expand our dealer network. Whether you have 100 head or 100,000 head of livestock, we have solutions to last you through the years.